Twenty credit officers from Jordanian micro-credit company Tamweelcom learned how to better serve the youth market during a two-day “training of trainers” workshop conducted in Amman by regional social initiative Silatech. The training, which took place April 7-8, complements the introduction of Amal Al Shabab (“Hope of the Youth”), a soon-to-be-launched loan product for youth-owned startup microenterprises developed jointly by Tamweelcom and Silatech. 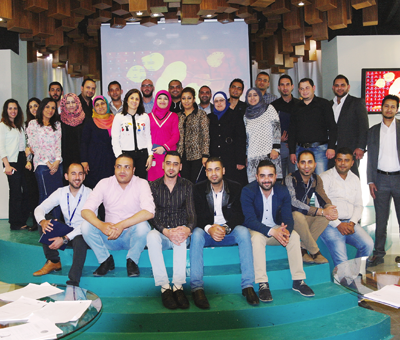 Designed especially for the youth startup market, Amal Al Shabab is expected to finance approximately 3,000 startup businesses in Jordan over a three year period, creating or sustaining an estimated 4,500 jobs as a result. Youth unemployment in the Arab World stands at 28 percent—the highest of any region in the world. In Jordan, youth unemployment tops 30 percent. Amal Al Shabab is one of a new breed of youth startup products that Silatech is helping microfinance institutions in the region to bring to the market in 2015. Innovative financial institutions such as Tamweelcom also stand to gain from targeting the startup market, as the larger financing amounts required by this cohort can general higher profits. Younger clients can offer substantial lifetime value, and institutions can gain significant positive visibility by implementing meaningful solutions in the fight against youth unemployment. During the workshop, Silatech representatives trained the credit officers about the details of the Amal Al Shabab product, outlined approaches and communications techniques for youth, and advised on more accurate and relevant criteria to use when screening loan applicants. Tamweelcom is a pioneering Jordanian non-profit microfinance company that endeavors to fight poverty and unemployment. It is wholly owned by the Noor Al-Hussein Foundation (King Hussein Foundation). More than 300,000 clients, 94% of whom are women, have received funding since Tamweelcom’s inception in 1999. Silatech is currently working with 30 microfinance institutions in 11 countries throughout the region, and has to date enabled more than 80,000 youth-run businesses to start and grow, supporting more than 130,000 youth jobs. Silatech is the Arab region’s largest provider of youth financial services.